That’s pretty much what it sounds like all morning at our campsite, because Crystal and I cannot stop shrieking about the ridiculous amount of flies swarming around our heads at breakfast. They were particularly bad yesterday — the woman at the Apostles wine shop told me they hadn’t been this bad in years — but this was something new. A drop of egg fell off my plate, and it was black in less than a second. Needless to say, I ran screaming back to the car. Despite the little menaces, I was sad to leave Johanna campsite. I don’t think I’ve ever seen so many stars in my life, and waking up to the crashing waves felt like a dream. This place goes on my list of top sunsets ever. But we had to set off, and set off we did, straight to Aussie’s famous Twelve Apostles. Way back when in September, I apologized to my Melburnian friend Jackie for making her take me all the way out there because I’d never seen them. She said, “No need. No matter how many times I come back, they look different every time.” She was right. This time they were bathed in a hazy morning sunlight that seemed to glow from below. It was probably the heat meeting the cold sea air — today it would reach 41° C.
We reached the little seaside town of Port Campbell just in time for lunch and quickly decided to make an afternoon out of it. Swimming there is like swimming on a postcard. Huge sandstone cliffs to your right; tiny waves and nothing but blue-green sea to splash around in. After eating and lazing around for a bit, we spotted some kids jumping off the pier 50 meters down, so we decided to give it a go. “Jump on 3 and swim back!” And…go. Here’s one thing that’s different about swimming down here in the Southern Ocean…it is fuh-reezing! With water that blue, I forget Antarctica is just-down-there. And on a day this hot it was exactly what we needed! One more thing — I’d never even heard of the Bay of Islands or the Bay of Martyrs, but they are serious must-sees if you’re doing the Great Ocean Road. Easily marked, just as beautiful as the Twelve Apostles, and way less crowded, they were both well deserving of our synchronized, “Wow,” as we passed by on our way to Warnambool. Do you know when you’re sitting around a table with friends, chatting away, and somehow, inevitably, the “What if?” game starts? Usually you’ll get to the one, “What if you were stranded on a desert island, and you could only bring one food with you —what would it be?” I like this one because I don’t even have to think about it. My answer is cheese. Cheddar (which is called “Tasty” in Australia, I might add), brie, goat cheese, Parmesan, everything. The fact is, I like cheese. 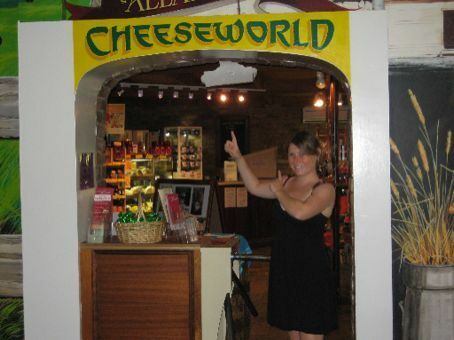 So when I found out there was a place called “Cheeseworld” off the Great Ocean Road, I deemed it a must-see. 13K before hitting Warnambool, we pulled off the road into an almost deserted parking lot. We walked inside: Tasting at 4:30 p.m. Sweet. It was 4:10. Good thing too, because we were able to spend the 20 minutes idling around the Cheese Museum opposite the tasting room. The place had everything from the early farming days of Warnambool and the surrounding areas. Old typewriters, butter churns, a complete early 1900s tool-kit, even an entire room dedicated to old engines. My brother, the engineering major and car industry career-man, was in heaven. Definitely worth a look, of course, but I was there for the cheese. I went back inside to find Julie, our awesome tasting informer, bringing out about eight tubs of tasty cheeses. Besides the three of us, there were two other guys there for the tasting — and one of them had a “Brooklyn” T-shirt on. “Hey there, where are you guys from?” I asked, knowing the answer already. “Where in New York?” Jeff says. “Where in Manhattan?” I ask, enjoying the irony. “Ah, I was on 87th and 1st,” I say. “103rd and Central Park West,” says my brother. We all nod. We’ve all come halfway around the world, to the far reaches of southern Australia, and we meet our fellow New Yorkers at Cheeseworld. Typical. Then we dug in. Julie doled out tomato-chive, curry, caroway, mature, cracked pepper and herb and spice. I loved the cracked pepper and tomato-chive, and quickly asked for seconds. Thanks Julie! Delicious. Crystal and Jeff then filled up on the local Tamboon ice cream — honeycomb is a must taste — and we were off to the Grampians. Grampians National Park hadn’t been on my “must-see” list before coming to Australia, but quickly made the list after I’d arrived. The Grampians, according to Lonely Planet, “are one of Victoria’s most out-standing natural features.” Coming in at 167,000 hectares, the park features some of the oldest Aboriginal cave art, and more than 150 km of beautiful walking tracks. Well, they’re right. The drive in was spectacular — I highly recommend coming from the Great Ocean Road through Dunkeld — the range on the way in looks like two waves about to crash into the sea. So here we are in the Grampians; the cockatoos are screaming their little white heads off and Crystal and Jeff are trying to convince me to do an overnight hike tomorrow. Leave Nomalita for a night? Really? We’ll see.